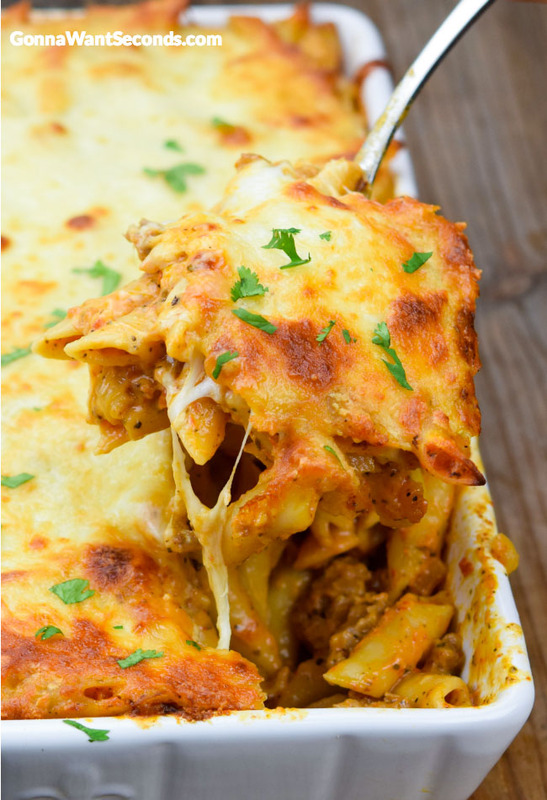 When you need a creamy, cheesy pasta dish, Baked Mostaccioli is your answer. It combines sausage, alfredo & spaghetti sauce and more for an amazing dish. When I crave a cheesy decadent easy pasta I often turn to Baked Mostaccioli.With loads of pasta, tomatoes, creaminess and a browned cheese topper it delivers. With this yummy recipe, I get all that and more. And to make things better, this dish is super easy to make. You do a little chopping, a little stirring, and then the oven does the rest. “Mostaccioli” or “little mustaches.” (Tip: To sound like a pro chef, making sure that your mostaccioli pronunciation involves a “ch” sound where the double “c” is). It is, of course an Italian pasta – or is that redundant? In Italy, this pasta is known as penne lisce and stems from a region in Southern Italy. It is used in a variety of recipes like Prego baked mostaccioli, Creamette baked mostaccioli recipe, and or in any number of other baked or stove-top pasta recipes. Mostaccioli, like most types of pasta, is made of semolina. Is Mostaccioli Pasta The Same As Penne Pasta? Mostaccioli pasta is similar to Penne, and most people probably wouldn’t notice the difference looking at a pot of each sitting on the stove. On close inspection you’ll notice Mostaccioli doesn’t have the little “ribs” that both Ziti Rigati and penne have. In other words, Mostaccioli is smooth. It is also slightly larger than penne, though it has the same angled ends as penne pasta. While on the subject of other pastas you might try my Five Cheese Ziti Al Forno or Million Dollar Spaghetti since there’s never enough pasta to go around at family reunions, events or parties. If you’re making a big batch of something, Beefaroni is an economical option that everybody loves. Another favis my Baked Ziti it’s just terrific, if I do say so! 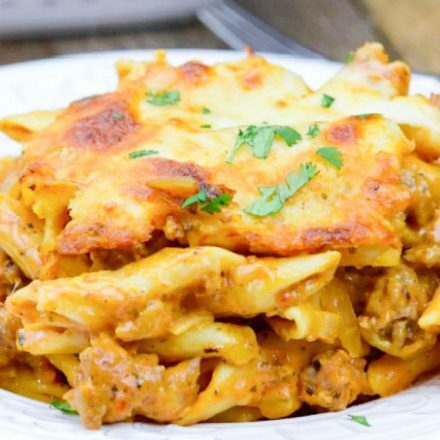 Yes, you could pamper yourself by googling “baked mostaccioli near me”, and let somebody else clean the dishes… but if you’re the homemade type (like me), you’ll want to try my recipe. It might look complicated, but my Baked Mostaccioli with alfredo sauce and tomato sauce is easy to make, fear not! First, you’ll preheat your oven and spray a 9×13 dish with non-stick spray. Next, you’ll cook your pasta per box instructions until it hits el dente then drain. In a separate pot, you’re going to cook that sausage, crumbling it with a spoon while it cooks. When cooked remove it and dab the grease off with paper towels. Now, your on to the mostaccioli sauce, add in the garlic, onion, and seasonings and saute them until soft in the remaining grease from the sausage. Then, in goes the spaghetti sauce, alfredo sauce, and that drained sausage. Mix the pasta together with the sauce and add in half of the Mozzarella. Mix it all up and pour into your baking pan. Sprinkle the rest of the cheese across the top evenly, and bake. 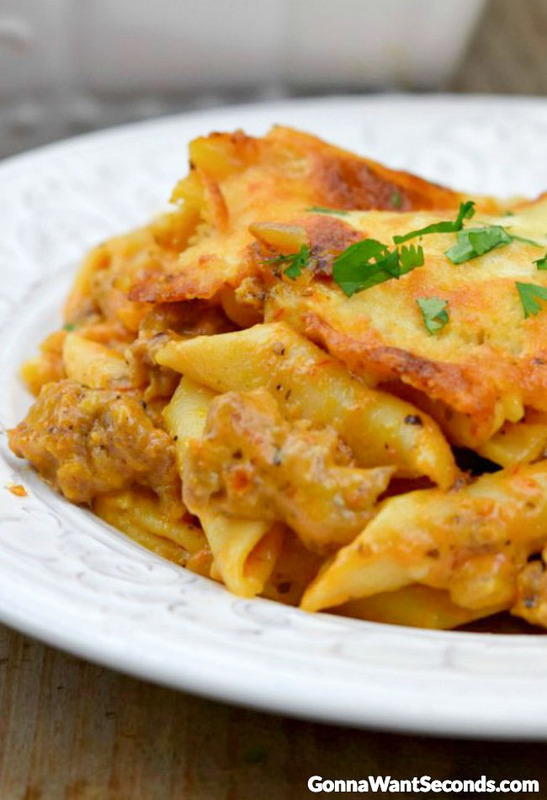 What Do You Serve With Bake Mostaccioli? When I’m whipping up Bake Mostaccioli for a gathering, often pair it with a light salad with tomatoes, carrots, bell peppers, and spring peas. Besides, it adds color and fresh flavors to the table. For a sweet finish to this hearty meal I often make Tiramisu, or even some spumoni ice cream. I use mostaccioli because that’s what I’m used to. But it’s absolutely fine to substitute penne or ziti noodles. 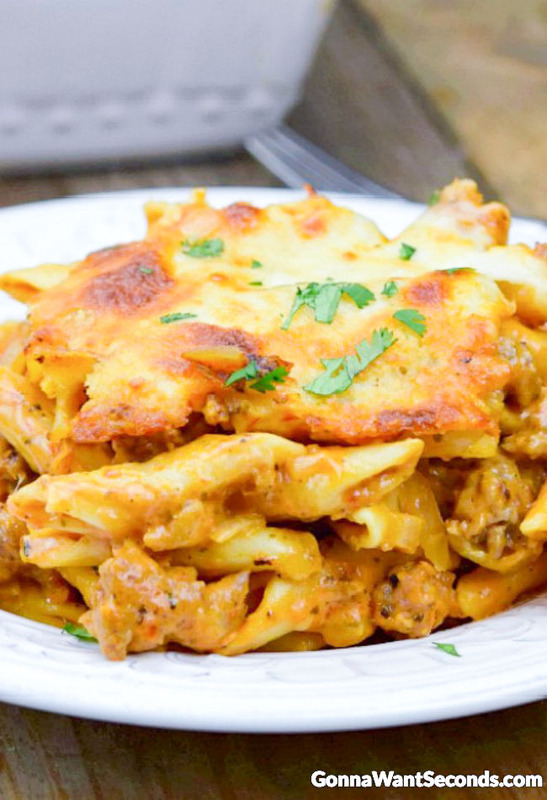 Make sure that you use a quality mostaccioli noodles (or a substitute) when making this dish. Less than quality noodles won’t hold up in the finished baked dish. I generally use Barilla. Pasta Water: I grew up believing that you have to salt the water that you are boiling the pasta in, but I never understood why. I knew that the salt was supposed to help the pasta taste better, but how exactly does that happen. If you’ve heard that the salt lowers the boiling point of the water… well, that’s a myth. The amount of salt isn’t going to affect the boiling point. So why does the salt matter? Here’s why. We all know that the pasta absorbs the water as it cooks. So it makes sense that if the water is salted, the pasta will absorb some of the salt as well. That means the pasta is getting flavored from the inside out. Salted water means better tasting pasta. And that’s important because the pasta is the bedrock of the rest of your dish. If your pasta is bland, even delicious sauce will be hard pressed to improve the flavor. But if your pasta is well seasoned, even the bland sauce will taste decent. Tip: When you use salt in your pasta water, you can reduce the amount of extra salt in the sauce recipe. But what is the proper amount of salt to use in your water? I’ve tried various ratios and measurements – some yielding bland pasta, and some yielding pasta that is so salty that it’s nearly inedible. The best ratio I’ve found is to use 1 1/2–2 tablespoons of salt in about 6 quarts of water. Cooking to Al Dente: This recipe calls for you to cook the pasta until it is “al dente.”This means that you want the pasta to be firm when you bite it – not hard, just firm. It’s important that you don’t overcook the pasta, al dente pasta is perfect for this recipe. This is because the pasta will continue to cook and absorb the sauce when it’s in the baking dish. If you’ve overcooked the pasta in the boiling water, it will come out mushy after cooking in the baking dish. Red Sauce: If you have a favorite homemade marinara sauce, by all means, use it! The delicious taste of homemade, slow-cooked red sauce is virtually unmatched in the pasta sauce world. My Sunday Gravy is always a homerun! However, as much as I love homemade sauce, using a good quality jarred sauce makes the preparation of this dish a ton easier. It cuts the prep time down significantly, which means this recipe is doable on a weeknight. Rao’s Homemade Marinara Sauce – This sauce is the number one choice of both Serious Eats and Cooking Light. It does cost about nine dollars a bottle, so choosing to buy this sauce is a bit of a splurge. It’s a very flavorful sauce, but its cost ensures that I really only use it when I’m serving it over plain spaghetti. Bertolli Tomato and Basil Sauce – This sauce is recommended by Cook’s Illustrated via their County Cooks division. It’s a solid sauce at a manageable price. Alfredo Sauce: You will notice that this recipe also uses a jar of Alfredo sauce. If you want to make that from scratch, I would recommend making a béchamel or a thicker white sauce. Let me tell you though, the jarred alfredo sauce is great in this recipe and you certainly can’t beat it for ease of preparation! Herbs: I love using dried “Italian Seasoning ” in this recipe. It’s awesome that I can get a great combination of herbs in a single little jar. Generally, you’ll find that Italian seasonings include oregano, basil, marjoram, thyme, rosemary, and savory. Assembly the dish completely according to instructions. Remove from the fridge 30 minutes before baking. Baked, covered, for 50-60 minutes. Cover the dish and freeze for up to three months. If you’d like your Mostaccioli to taste more like lasagna and be a bit heavier, add ricotta cheese. Follow the recipe as directed but I’d suggest you use a larger 3-quart baking dish. At step 4 simply add half the sauced pasta to the baking dish, then spread 1-15 ounce container of ricotta in a layer over the pasta, then top with the remaining pasta. Sprinkle the top with remaining mozzarella and parmesan. Bake, uncovered, in preheated oven until heated through and cheese is melted. What Are Some Mostaccioli Variations? Of course, with every good dish, there are great variations that you can use to make it your own. I use any of these baked mostaccioli change-ups to keep things interesting while making this an easy staple for the family. Another favorite variation is Baked Mostaccioli Florentine. The term “to Florentine something” is adopted from Florence, Italy (of course), where featuring spinach in dishes was the thing. In this recipe I layer in spinach — and mix it up with the sauce and noodles before topping with cheese, but I’ll expound on that in another post later! If I want to reduce the calories in baked mostaccioli with meat sauce, I cut the sausage down to about half and add in 4-6 cups of spinach to make up for the lost bulk. This cuts the calories significantly while still allowing the spicy flavor of the sausage to blend in with the tangy taste of the spinach that fills out the sauce. Make it your own, toss in your favorite cheese, Italian sausage, whatever… either way I predict this Baked Mostaccioli Recipe will become a high demand recipe in your home, it is in ours! Please enjoy! Cook pasta according to package intructions, in a large pot, just until al dente. Drain and set aside. Dry out pot and set aside. In another large pot, brown sausage over medium heat, crumbling with a spoon as it cooks, until no longer pink; Remove sausage to paper towel lined plate and set aside. Pour off all but 2 tablespoons of the fat from the pan. Add the onion, garlic, dried Italian seasoning, salt and pepper and sautee on low heat until they're very soft, about 10 minutes. Add spaghetti sauce, alfredo sauce, and drained sausage, to skillet and mix. Best. Recipe. Ever!!!!! We ate the entire casserole dish in 1 meal, whoopsie! Don’t see a link to the video? Am I missing something. Thanks so much, Patricia! It’s a big favorite at our house! Thanks Kathleen! I’m making it tonight! Oh yes ! Gonna want seconds 🙂 Thnak you so much !